It's patent season, and Apple's been awarded a new one for a device that could be worn "as a wrist-watch device". Sounds like an iWatch to us. The patent document also suggests it could be a pendant device, headphone device, earpiece device (hello, earputers) or other miniature device or media player, so there's no guarantee this is the oft-rumoured iWatch. The reason for all the could-bes and maybes is that this is a concept design patent rather than a design patent - which means that the look of the device could change drastically before it hits the market (and that's if it even does). 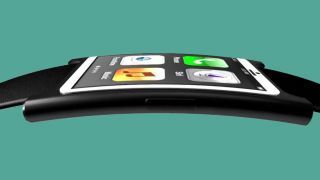 The patent document suggests that such a device could include a camera, as well as an antenna and light sensor, and that the housing - the body of the the thing - could be curved. It's not clear if the device would come with a touchscreen or not, nor whether the display would be OLED, LCD or something else entirely. Connectivity could include cellular service, Wi-Fi and GPS, according to the patent documents. This isn't the first iWatch-type patent we've seen from the Apple camp, but it's the surest sign that the company is working on some kind of wearable tech. Does that mean a WWDC 2014 reveal is on the cards? Here's hoping.